A group portrait of eight mostly young children wearing western clothing, standing next to the American Presbytarian Mission building at nasir. In the background is a water tower with a raised tank for piped water supplies. 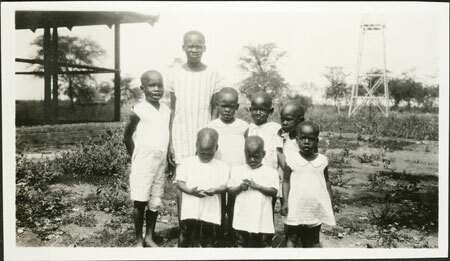 The children are identified as eight motherless children being cared for by Blanche Soule at the mission which Evans-Pritchard visited in 1931 and again in 1935, when he was presumably given the photograph. Note on print reverse ms ink - "My eight Nuer motherless children" & [different hand] "Miss Soule (missionary)"
Morton, Chris. "Nuer orphans at mission" Southern Sudan Project (in development). 03 Jan. 2006. Pitt Rivers Museum. <http://southernsudan.prm.ox.ac.uk/details/1998.346.346/>.